Classic Army has produced a range of Sportline models for the last few years, and the LWRC licensed full metal model being reviewed today is pretty much at the top of their Sportline hierarchy. It combines full metal externals with LWRC licensed trademarks, filled with Classic Army internal components to make for a decent entry level AEG. I will discuss all of the various aspects of the LWRC M6 in this review, so keep reading for more information! 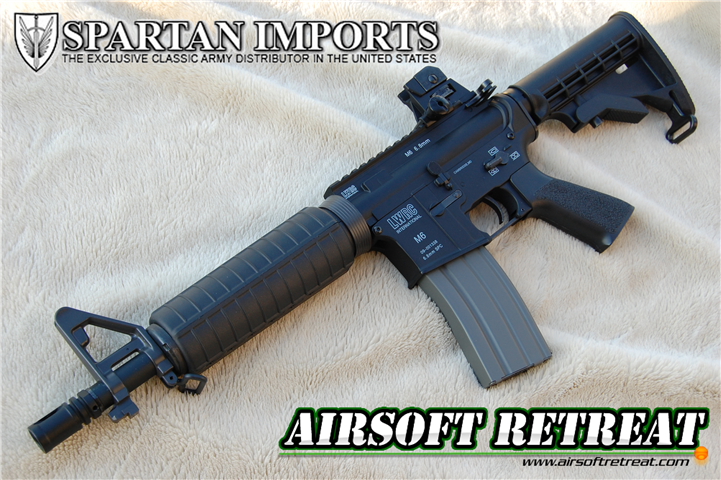 I obtained this replica directly through Spartan Imports, who is the primary US distributor for Classic Army guns. The short barreled model being reviewed today is available at most major airsoft retailers, such as Airsplat, Evike and Airsoft GI, all priced at $199.99 at the time of this review. This includes aftersale support through Spartan Imports, who can get you replacement parts if needed. As mentioned before, the LWRC Premium Sportline M6 was designed as an entry level AEG with a higher than normal external quality and licensed trademarks. It is priced on par with other full metal AEGs from ACM manufacturers, making it a great option for a first AEG. It is available with two barrel lengths, the M4 standard 14.5", or the CQBR length barrel being reviewed today. It largely features standard M4 type furniture, with the exception of the TD type pistol grip. Classic Army packaged the LWRC sportline in a high quality cardboard box complete with a carry handle, allowing you to use it as a makeshift storage box. Inside the box, there is a pressed cardboard inner liner which keeps everything safe during shipping. There are full color images of the gun as well as information about the gun itself printed on the box, giving you something to look at before you open it up. The first thing I noticed upon looking at the gun itself was how nice the painted on trademarks looked, and how they added to the very realistic look of the gun. Along with the gun itself, you will find a single 300 round hi-cap magazine, small bag of CA BBs, a thorough manual, complete CA catalog, and the ubiquitous cleaning/unjamming rod. You will need to purchase your own battery, however, Spartan Imports has put together a “Skirmish Pack”, which includes everything you need including a battery, charger, sling, and sight, however, I haven't seen it for sale yet. As mentioned previously, this is a full metal AEG, which is a departure from traditional Sportline guns, which normally have polymer externals. The externals on this gun are on par with the older CA pro-line externals as far as fit and finish goes, which is a step up from most budget AEGs. The stock is a 5 position LE type M4 retractable stock, which helps shooters of all sizes to utlize this gun. It extends to each of its 5 positions easily, and locks in with very little wobble. At the bottom of the stock, you will find a metal sling mount which can be used in conjunction with the front sling mount to hang a two point sling. The receiver of the LWRC is made of metal that is finished in a matte black color. The upper and lower receivers are secured using hex screw retained body pins, and there is zero wobble between the two. The look and layout of the controls are the standard M4 design, so if you've ever used an M4, you'll be able to use this with ease. Unlike most M4 AEGs, pulling back the charging handle does not open the dust cover. Instead, it is secured using a magnet, and opening it exposes the faux bolt carrier, which is only about half length, and doesn't move with the cocking handle at all. The selector switch is kind of stiff, but it locks very well into your chosen setting. The pistol grip is a TD type unit, which is slowly but surely taking over every AEG it seems like. I'm certainly not complaining, as it looks great and is very comfortable to hold. The bottom of the grip has a heat sync type adjustment base, with a large flat head adjustment screw. Moving forward from the receiver, you'll hit the M4 length handguards, which are secured to the receiver using a real-steel type delta ring. This makes swapping the furniture out for aftermarket units quite easy. The handguards lock in with VERY little rotation, and feel great, as they are made out of CA's nylon polymer material. There is room inside the handguards to hold your chosen battery, preferably a 9.6v nunchuk unit, or a small lipo pack. The metal outer barrel is 9.5" in length, as measured from the rear of the delta ring. It is terminated in 14mm- threads and an orange plastic flashhider that is glued in place. The threading is deep and clean, so you should be able to attach your desired muzzle device with ease. It is a multi piece outer barrel design, but thus far, it is free from wobble. Aiming this replica is accomplished using the included metal adjustable sights. The rear is a cut down carry handle design, and the front is the standard triangle front assembly. Both are made of metal, and are adjustable for windage and elevation. Mounting optics is an easy option using the 20mm flat top rail. One of the big selling points of this gun are the licensed trademarks through LWRC. On the Pro-line gun, the trademarks are deeply engraved, however on this Sportline model, the trademarks are painted. Engraved, or even laser engraved would be a nice upgrade, however, they would add to the cost of the gun. The trademarks are fairly sturdy against being scraped off, but oddly enough, after holding the gun by the magwell for a while without gloves, my sweat kind of softened up the paint, allowing part of the trademark to be rubbed off. As mentioned previously, the included magazine is a full metal 300 round hi-cap with the standard bottom winding wheel design. The magwell is very nicely sized, and fit every aftermarket magazine that I tried to put in it just fine. Even magazines that tended to wobble in other guns were much more secure in the LWRC. Rate of fire was fairly low, which I believe is due to the motor. CA motors tend to lean more towards torque as opposed to speed, and I was only able to get 17 RPS out of a mid level output 11.1v LiPo battery. Range and accuracy are what you would expect out of a short barreled gun, with my testing giving me consistent torso sized hits at 155' reliably. Past that point, my shots tended to veer to the right or left with no real consistency. Inside this thing, you'll find a relatively standard V2 gearbox, filled with quality CA components. The shell is fitted with 6mm steel bushings, steel gears, and a polymer piston with polymer ported piston head. The cylinder head is also polymer, and the cylinder is blue anodized aluminum. The compression components give great compression, however you do get some slight leakage at the air nozzle itself. The gears were well shimmed, and a light application of grease keeps everything moving smoothly. The inner barrel is 300mm in length, and is coupled with a metal hop-up unit. The hop-up keeps the barrel pretty well stabilized, however, there is no spring at the top of the unit to keep it pressed against the gearbox shell. The motor is a fairly basic unit that is marked as being high torque. It is fairly easy to rotate by hand, so it doesn't have too strong of magnets, but it gets the job done. It is a little bit noisy compared to some other motors, so it'll be the first thing I swap out on my gun. The overall design of the gun lends itself well to aftermarket modification, both inside and out. It has a standard V2 gearbox, so internal upgrades are a piece of cake, and the externals are easily modified to fit your liking. On mine, I've switched over the furniture to Magpul PTS MOE units, and might end up throwing a 9" free float RIS kit on it, after wiring it to the rear. I didn't really know what to expect from the CA Premium Sportline LWRC, as the only other CA Sportline guns that I'd handled recently were the Game Face ones, which left a LOT to be desired. Thankfully, CA made the LWRC MUCH better, both inside and out, making it a skirmish ready gun out of the box. I'd be interested to see them come out with other sportline variations of the LWRC licensed line, including railed models, or other custom guns. As it sits now, the LWRC Sportline M6 is a blank canvas ready for you to tweak to your liking. Many thanks again to Classic Army, and of course, Airsoft Retreat! I want to say it's somewhere around an M110 strength spring, based on the FPS.